It's been quiet around here, hasn't it? Spring Break was last week and the family and I were on the road to do a little house hunting for our next move this Summer. Ah.. the adventures of military living! It was successful and now that that is behind me, I am back with more to share with you all. Today I wanted to play along in the SCS CAS challenge of Bluebird Color Palette. This color scheme is so pretty and just screams Springtime. It gave me a chance to play around with a stencil I had that hasn't been used to make a birthday card. For this, I placed my stencil where I wanted it and applied a little piece of washi tape in a few places to hold it. I sprayed some watered down acrylic paint and used a tissue to dab the excess around it. I then sponged some Distress Ink in Pumice Stone around while the stencil was still in place. Once I got the look I wanted, I took off the stencil and layered it to a piece of SU! RR cardstock. I used a birthday stamp from Stampabilities that I have had and fishtailed it to a piece of matching SU! BB cardstock to match the base. That is then popped up over the main panel. I finished it with a few self adhesive rhinestones and pearls. Super easy and makes for a quick card. Well, that is it for me today! Be sure to check back early in the morning tomorrow for Your Next Stamps April digi release. Super cute images that you don't want to miss! Plus, you will have a chance to win some! Have a great Monday!! Today is another Friday Fun Project at YNS! 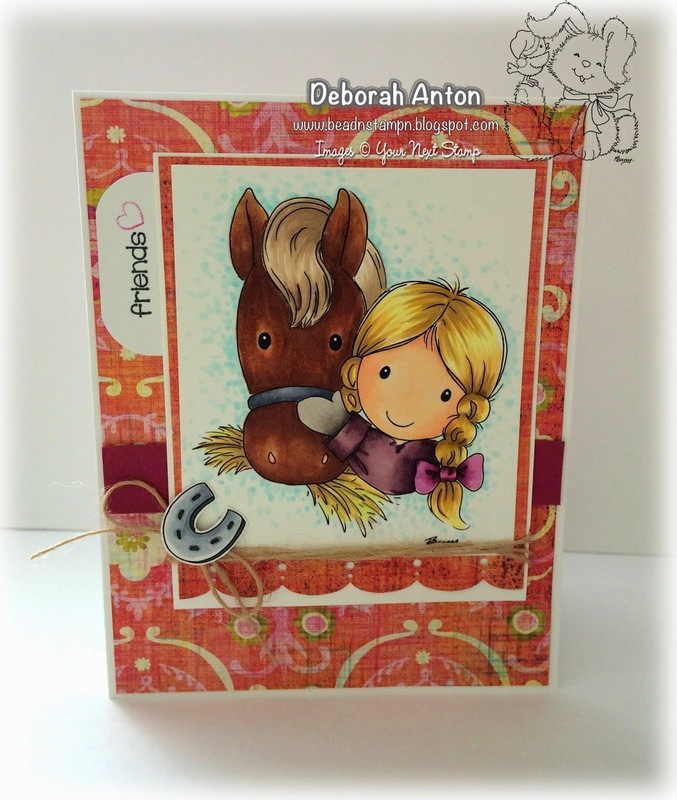 Today I am sharing with you Gretchen with Jolly and using this months YNS challenge sketch. Welcome back to another Timeless Tuesday Challenge friends! This week our fabulous hostess is Katie and she is challenging you to add a touch of gold in your card or project. There are many things you can use for this - embossing with gold, gold leafing, gold leaf pen, gold paper, gold embellishments, anything! Pull your regal side out and see how you would use a touch of gold in your project. For my card, I pulled out my set of Flowers for Jan to emboss with gold and color it in with Copics. We hope you are able to add a hint of gold in your next project and play along. Thanks for popping in and have a great Tuesday!! Happy Monday and Happy St. Patrick's Day everyone! Hope you are all have a good start to the week and wearing green today. I had some time to play along in the MFT Wednesday sketch and it is a fun one! While I suppose I should have done a St. Patrick's card, I really had Spring on my mind and made this little ditty. I used my new polka dot cover up Die-namic for the background and including some patterned paper from Echo Parks Head Over Heels. I started with some heavyweight cardstock for the base and layering it with some black cardstock and the patterned paper. The cover up was cut out and then run through with a CB folder of Swiss Dots for more texture (and more dots!) and placed over the patterned paper. I used a piece of vellum for the diagonal layer, embossing with detail black the sentiment from Sentimental about travel. To finish the card, I used the die-namics Fly a Kite for a focal point using some coordinating patterned paper and some twine. A super fun sketch for sure! Well, that sums it up for me today. Thanks for popping in and make it a great day! I hope you are having a great weekend and hopefully have better weather than we are here. Back to the cold and wet weather after a few days of sunshine and warmth. Today I played along in the CAS Sunday challenge. The challenge is one layer cards. LOVE those. I decided to dust off my Lawn Fawn set of Flying by to create this card. 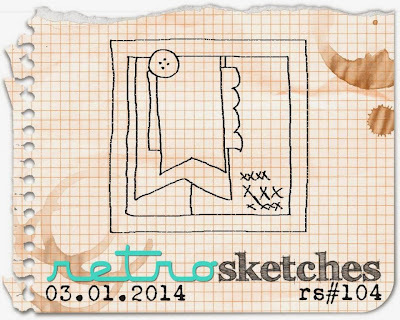 I stamped the image in Memento black before coloring in the images with some colored pencils. The sentiment was stamped using Memento Teal ink. Super simple and super fun. I may have to make a few more today of different one layer cards. They make for quick 10 minute cards. Thanks for flying by and taking a quick peek! I have a fun challenge this week that will incorporate something I think everyone has! Washi Tape! Washi Tape is a lot of fun to use and has many uses for it. It's inexpensive and you can tear it, emboss it, write on it, tape up a present, seal an envelope, the list goes on! For my card, I kept it fun and simple. I needed a 40th card for a friend turning 40 and fabulous, so I wanted the focus to be on the numbers. The base card and black panel were made using Flourishes classic cardstock in white and black. The numbers were stamped with black Memento ink and colored in with Copics. I fussy cut them out to be popped over a black cardstock circle. I made the tag with some scrap Flourishes Kraft cardstock and added an eyelet and some ribbon to the top after I cut the corners. I then used the washi tape to help adhere the tag to the main panel of the card. The circle and numbers were then also popped up over the tag with the "th" stamped and cut out. The sentiments were stamped directly onto the main panel and finished with some self adhesive rhinestones. We hope you are able to play along and be sure to link up below. 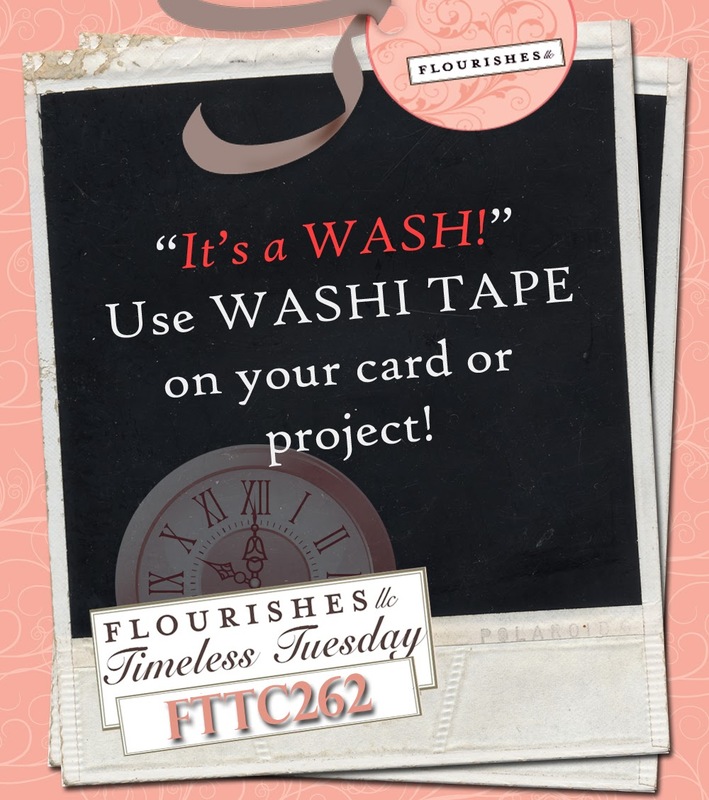 Before you head off to wash it up, be sure to check out the other fabulous designs the Timeless Tuesday Team created! 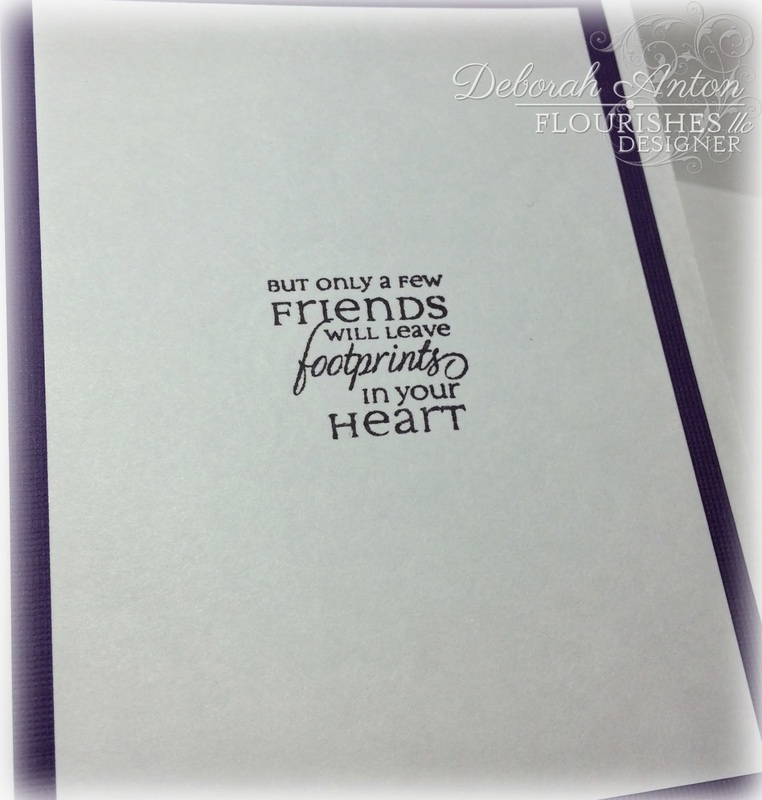 It's another Friday Fun Project with Your Next Stamp along with a new monthly sketch and inspiration picture. For my card, I created one that captures both the sketch and inspiration colors. The new release of Sleeping on the moon was used as my main image colored in with Copics. I used Neenah cardstock for my base and a scrap of patterned paper from my stash for the top layer. 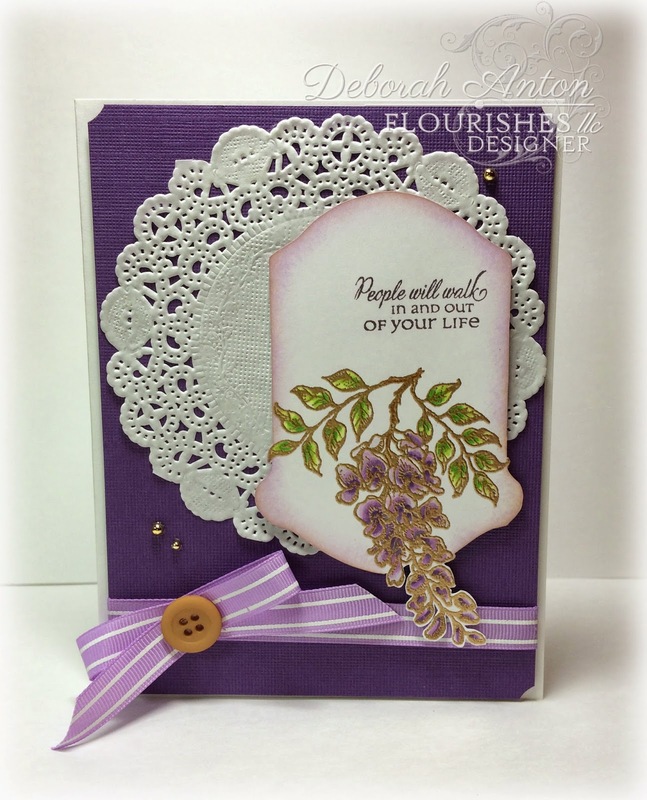 The sentiment was stamped using the new release of Tea-riffic (which is on sale!!) and place along the side of the image. I finished the card with some ribbon and self adhesive pearls. We hope you play along and link up on the challenge blog for your chance to win!! Thanks for stopping by and have a great weekend! Welcome back friends to another Timeless Tuesday Challenge! (on Wednesday!) Allison is our fantastic hostess this week and she is challenging you on using one of the newest and trendy items in paper crafts. 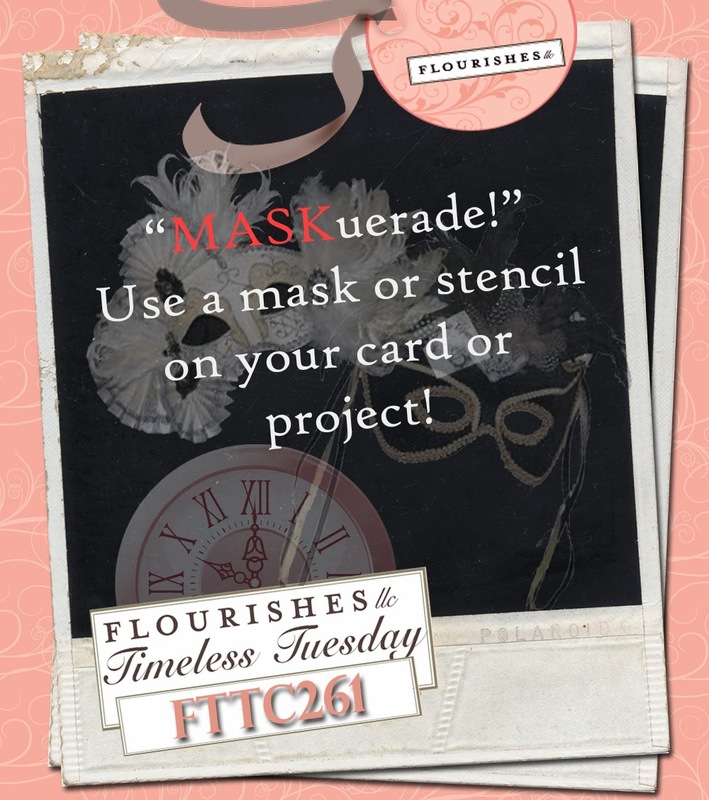 That is to use a mask or stencil on your card or project! You can find many companies today carrying their own brand of stencils to meet the demands of those who want to use different mediums to create a unique look on a project. I don't usually use stencils, partly because I am unsure of how to, but after looking at many different creations from many, I decided to try a medium that seems to be popping up - Modeling paste. I placed my stencil over some Flourishes cardstock in Pistachio and added some modeling paste over it. It dries fairly quickly, so I was able to sponge over some ink to tone down the whiteness of the paste. I then popped up some patterned paper that was in my scrap pile over the base and stamped the image from Flourishes Just my type set. I cut that out with my dies and popped it up over the fishtail. I completed the look with some ribbon and twine, button, and some self adhesive pearls. I think I like how this turned out and I know I have a few more tries to perfect some different styles with stencils. Either way, it was a fun challenge and one I know I will do again soon! Thanks so much for stopping by and be sure to check out the other fantastic projects from the Timeless Tuesday Team. I hope you all are doing well with this last bit of storms that have rolled through. We are still making our way out of snow and ice, with no school, but lots of fun for the boys! Of course, I had to take advantage of this extra time and make a card with YNS newest clear stamp release of Tea-riffic! I also used the coordinating Tea-riffic die set. This set is so much fun and perfect for all those book, coffee, and tea lover friends in your life! For the layout of this card, I used the newest Retro Sketches sketch to create this fun look while using some Basic Grey patterned papers from the What's Up collection. I cut out the books with the matching die and then stamped the image with some Memento Black ink and coloring it in with Copics. I did the same with the coffee mug and added the smiley face that comes in this set. That just makes me giggle. It's such a cute smile. The images were popped up over the banners with some foam adhesive and finished with a button and some bakers twine. I stamped the sentiment directly onto the papers with the finishing sentiment on the inside that says, "you can pick up right where you left off." I just love it! Thanks so much for taking a peek and hope you all have a warm and wonderful Tuesday!! 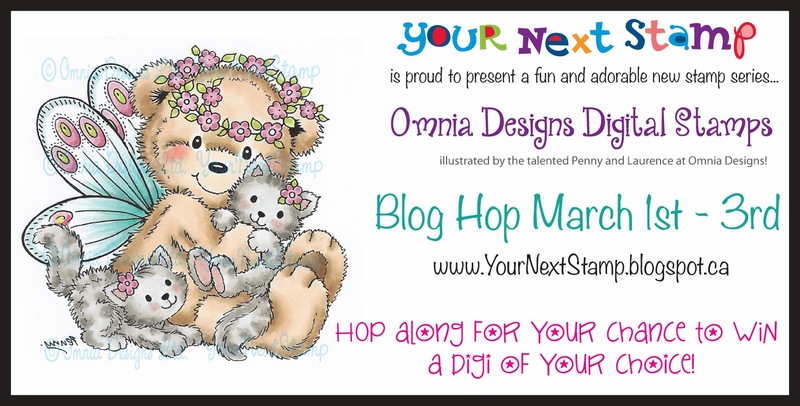 Welcome to the March YNS Your Next Stamp Blog Hop Digital Release! We are so happy to have you join us this month, we have 9 brand new exclusive digital images from Penny and Laurence of Omnia Designs!! This month the hop begins on Design Team member, Bonnie's Blog...click her name to get back to the beginning at any time. We appreciate you hopping to each blog listed at the bottom of this post, just click on their picture and leave a comment on each blog to win some digital prizes!! The winners will be announced on the YNS Blog on March 4th. I am using the sweet image called Little Sister. How cute is she?! For my card, I used some patterned paper from MME called The Sweetest Thing. It fit perfectly with this image. :) The colors in this collection are so pretty and soft, and of course my favorite - Orange. I colored her in with Copics and cut her out with my scallop nesties. The cut out was sponged around the edges with some Memento ink in Toffee Crunch before popping her up. I added a paper doily to the back panel of my layout for some added "girly" touches. The card was finished with some self adhesive pearls and sheer ribbon. 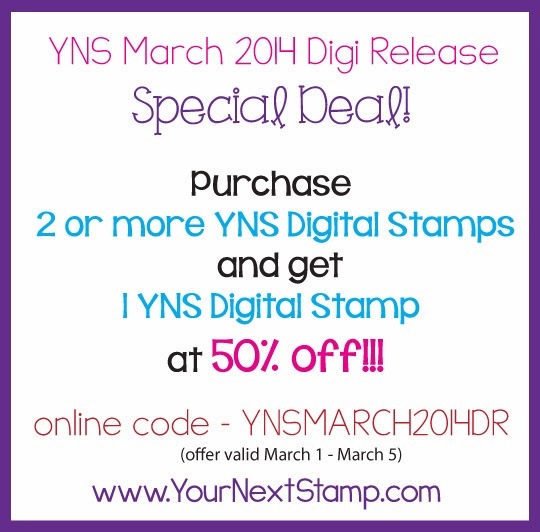 Just for you we have a special sale going on at YNS too!